Can a host keep your security deposit -- no questions asked? Can a host keep your security deposit — no questions asked? I have news for her: No, she can’t. This story is another in our file of outrageous tales of travelers being fleeced by hosts and franchise hotels alike. These owners are helping themselves to hundreds and even thousands of dollars of their guests’ money with little to no justification. And unfortunately, the cases are piling up at an alarming rate. Here’s one more disturbing report. Courtney Kerschner and her extended family recently enjoyed a “lovely” week at a vacation rental home in Rehoboth Beach, Delaware. On the day of their departure, they cleaned the house and took all the garbage to the curb. As long-time users of VRBO, Kerschner says their family of 12 knew the checkout drill well. The trouble began about one week after their stay when she hadn’t received the refund of their $500 security deposit. Kerschner was floored. She asked for further explanation. The host went on to explain a variety of reasons she intended to keep the security deposit. According to the host, the house was overly dirty. And as per her homeowners association’s rules, the garbage should not have been at the curb on Saturday. As a result, her neighbors had reported her to the HOA for a garbage violation. Kerschner says that when they left the home, the garbage cans were neatly lined up at the curb. The host sent a photo of three trash cans at the curb. The cans were filled to the brim. The next picture had all the bags in the back of a pick-up truck. My husband brought the trash to the county dump on Sunday. Then he spent time washing the maggots out of the bed of his pickup and washing his clothes. I will not return your deposit. In fact, the situation ruined our whole weekend between calls from upset neighbors, renters and cleaners and a 6.5 hour round trip drive in the middle of the night, we will never rent our house again. It’s going on the market Labor Day. Kerschner continued to try to reason with the host, who was intent on keeping the security deposit. In her emails to the host, she was polite and tried to stay friendly. She asked the host to provide some concrete justification for the $500 security deposit loss. “Could we please have a copy of the original documentation from the cleaning services documenting their concerns,” Kerschner asked. In response to that request, the owner told her that she was under no obligation to provide such receipts. “As you can see, (by the contract) there are no documentation requirements around the security deposit,” the host claimed. 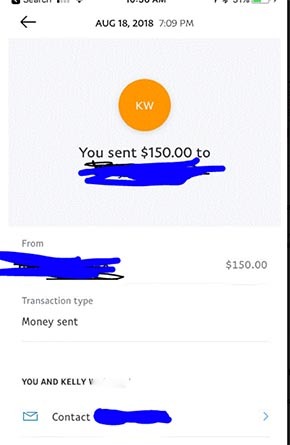 “Out of courtesy” she sent a copy of a $150 PayPal receipt she says was paid to the maid. Strangely, that receipt has all relevant information blacked out except the figure of $150. So, in terms of evidence, the host scored zilch for that document. And she provided no report from a maid or any photos that supported her claim that the house was overly dirty. And round and round Kerschner and the host went, firing off email exchanges for weeks. The owner refused to provide any receipts or evidence to support her $500 cash-grab. Finally, the host ended all negotiations with Kerschner. She would not be refunding the security deposit. Feel free to contact VRBO and an attorney. Because of this experience, we will never rent our home again. The pictures of the trash on the street came from the neighbor. The photo of the trash in the pickup is my husband’s car headed to the dump on Sunday. Realizing she was never going to get anywhere with this unreasonable VRBO host, Kerschner turned to the company for help. Kerschner reached out to the VRBO resolution team and asked for assistance. And that’s when she received some bad news. Although the family had paid for the week’s rental through the VRBO system, they made the security deposit via check. VRBO could not reverse the security deposit. Kerschner sent VRBO the email trail from the original reservation. In that exchange, the host first asks that Kerschner pay for the rental outside the VRBO system. She said it would save the family $160. Kerschner rejected that suggestion and told the host they didn’t mind the extra fee. The host then allowed Kerschner to pay through the VRBO system. Soon after though, the host asked for a $500 check for the security deposit. She said she didn’t know how to process the security deposit through VRBO. So the family sent the $500 security deposit check. And Kerschner says the host immediately cashed it — six months before the rental. Kerschner asked the VRBO representative if anything could be done to force the refund of the security deposit. Hitting yet another dead end with her struggle, Kerschner then turned to the Elliott Advocacy team for help. Is it possible to reason with this unreasonable host? I admit it. I like a challenge. So when I read through Kerschner’s months-long battle, I thought I could reason with this VRBO host. As you’ll see in a moment, I was wrong. But never fear, that’s not the end of the story. First though, let’s see what this VRBO host has to say about why she decided to keep the security deposit. I sent a cordial email to the host. Explaining that I had the photo of the garbage cans, I asked if this was her basis of keeping the entire $500 deposit. I suggested a fair resolution would be the refund of some of the security deposit. Soon I received a curt response from the host. So I tried for some clarification. I asked the host why her garbage pickup only came one time that entire week. The frequency of the trash collection seemed to be the core of the problem. A family of 12 generates a lot of trash. And how could the removal of several bags of trash lead to a $500 penalty? Again, the host quickly answered. She told me that garbage cans aren’t allowed on the street on Saturday. Those cans can’t go out before Sunday at noon. I live in an HOA and the trash only comes once a week. This is why I provide three trash cans. For four years this has never been a problem. The extra bags were fine. It was the flies and maggots along with them leaving the trash on the street all week. I’m out $520. They clearly didn’t follow the contract. You think I should pay for their lack of care for my property? Publish whatever you want. The host also complained that this family ate crabs and disposed of the shells straight into the cans. But Kerschner says that the family properly bagged all the trash. And the photos seem to support her position. How can a guest comply with these HOA rules? Noticing that the host’s response didn’t answer my question about the lack of garbage removal services, I tried again. There is a failed logic here. How can a Saturday to Saturday renter comply with your current garbage rules? This family put the garbage out on Saturday morning and checked out. And why did your husband have to drive there instead of hiring an outside garbage pickup to take away the trash? It would seem to me to be a much cheaper option. And then you would have an actual receipt for the cost of clean-up. Your $500 itemized list is just a handwritten one that includes your husband’s time and mileage to pick up some trash bags. I suggest that returning some of this security deposit is the correct thing to do. Nope. That didn’t do the trick either. The host soon came back with more hollow points. The trash comes on Monday. The contract says to pull it(the trash) down (the cans) on Monday. If the renters did not like this, they should not have signed the contract. They arrive on Saturday. Bring trash (down) on Monday. (That) Includes trash from people before them. States it in the contract. I’m out $520. Maybe I should charge them more for their complete negligence. So not only did this family of 12 have to contend with having just one trash pickup for their entire stay, but they had also inherited the garbage from the previous renters. Eww. Clearly though, this VRBO host was not going to return any of the security deposit willingly. I took a look at the contract and there is no information about the garbage days. The contract doesn’t even mention the strict garbage-can etiquette enforced in this neighborhood. I sent the host my copy of the signed contract. And I asked her to point out where she had provided this information. Kerschner says this was the only garbage information the owner gave the family. And that’s the last I heard from this unreasonable host. DON’T keep a security deposit out of spite or because you think you’ve been inconvenienced. If you don’t have a receipt for a replacement item or a repair, you shouldn’t charge them for it. Simple as that! DON’T forget to refund a renter’s security deposit. Most states have laws that define exactly how many days you have to refund the deposit (typically from 14 to 45 days), but in every state it is illegal to keep the deposit without just cause. In this case, all the host had was a self-created list of items that included her husband’s time to drive to the rental. Her receipt for the extra cleaning was also questionable since she had blacked out any identifying information. Lastly, it would seem that this host’s neighbors’ complaints to the HOA are what propelled her anger at Kerschner’s family. But who caused this problem? Based on the vacation rental guidelines offered by the City of Rehoboth, this host was not in compliance with the Good Neighbor policy. This policy requires property owners to provide clear information about garbage days to their guests. This ordinance also goes on to say that every owner must provide a copy of the Rehoboth Good Neighbor brochure. Kerschner’s family received no information about garbage removal or the Good Neighbor brochure. If you’re a regular reader of this site, then you probably recall a similar story two weeks ago. In that case, an unreasonable Airbnb host tried to fleece her guest by blindsiding him with a $1,470 excessive cleaning fee. That host refused to return the money that she had been able to grab because of an error in the Airbnb system. 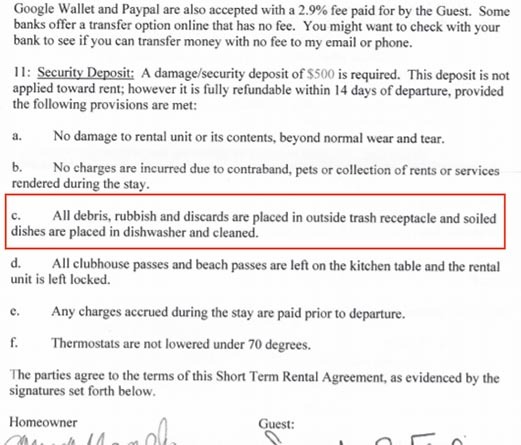 And like this VRBO host, she had the flimsiest evidence to support her looting of her guest’s finances. In the end, the Airbnb resolution team came to the rescue and refunded the money. I felt confident that all facts were on Kerschner’s side. A refund of this security deposit was the correct resolution. The only problem was that the family had made an error by paying the security deposit by check. And so VRBO could not technically refund the security deposit. Still, I felt strongly that minimally, VRBO should be made aware of this host’s antics. Despite her claims that she was out of the rental business, I could see her listing still on the VRBO site. So I took this dilemma to the VRBO resolution team and included the host’s handwritten itemized list of damages. Our executive resolution friends at VRBO quickly completed an investigation. And soon I received good news and a helpful tip for our readers from VRBO. Thank you for bringing this case to our attention. HomeAway offers protection against wrongfully withheld deposits for those who book and pay on our sites. Because this traveler paid their deposit offline, our system had no record of it ever being made. One tip for your readers: always book and pay for your rental through HomeAway’s checkout to be eligible for our Book With Confidence Guarantee, which protects against wrongfully withheld deposits and more. If an owner or property manager asks you to pay for anything outside of HomeAway’s checkout, contact our 24/7 customer support team for assistance. In this instance, our team has decided to reimburse the traveler for the cost of the deposit in hopes they will travel with us again. 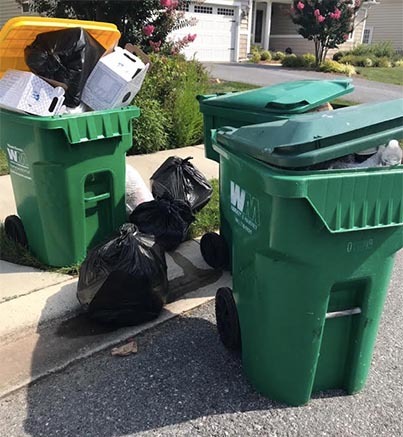 We have also reached out to the homeowner to ask that they update their rental agreement with specific instructions on trash pickup. Kerschner is pleased that her battle with this unreasonable host is finally over. And she’s learned a valuable lesson. When making future bookings, she’ll never again step off that VRBO platform. Do you think this host gave enough evidence to keep the family's security deposit?